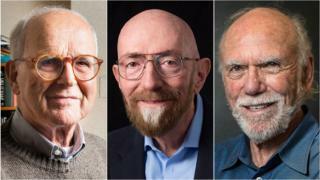 The 2017 Nobel prize in physics has been awarded to three US scientists for the detection of gravitational waves. Speaking at a press conference, Olga Botner, from the Royal Swedish Academy of Sciences, said: "The first ever observation of a gravitational wave was a milestone - a window on the Universe." The US Ligo and European Virgo laboratories were built to detect the very subtle signal produced by these waves. Even though they are produced by colossal phenomena, such as black holes merging, Einstein himself thought the effect might simply be too small to register by technology. But the three new laureates led the development of a laser-based system that could reach the sensitivity required to bag a detection. The result was Ligo, a pair of widely separated facilities in North America: one observatory is based in Washington State, while the other is in Livingston, Louisiana. The European side of the gravitational wave collaboration is based in Pisa, Italy. On 14 August this year, just after coming online, it sensed the most recent of the four gravitational wave events. Speaking over the phone at the Nobel announcement in Stockholm, Rainer Weiss said the discovery was the work of about 1,000 people. He explained: "It's a dedicated effort that's been going on for - I hate to tell you - it's as long as 40 years, of people thinking about this, trying to make a detection and sometimes failing in the early days, then slowly but surely getting the technology together to do it. It's very, very exciting that it worked out in the end." Nonetheless, the Nobel trio's contribution is also regarded as fundamental. Weiss set out the strategy that would be needed to make a detection. Thorne did much of the theoretical work that underpinned the quest. And Barish, who took over as the second director of Ligo in 1994, is credited with driving through organisational reforms and technology choices that would ultimately prove pivotal in the mission's success. The Astronomer Royal, Sir Martin Rees, said the three leaders honoured by the Nobel Committee were "outstanding individuals whose contributions were distinctive and complementary". But he added: "Of course, Ligo's success was owed to literally hundreds of dedicated scientists and engineers. The fact that the Nobel committee refuses to make group awards is causing them increasingly frequent problems - and giving a misleading and unfair impression of how a lot of science is actually done." Many commentators had gravitational waves down as a dead cert to win last year, but the Nobel committee has always been fiercely independent in its choices and has made everyone wait 12 months. Had the prize been awarded last year, it is very likely that the Scottish physicist Ron Drever would have shared it with Weiss and Thorne. The trio won all the big science prizes - apart from the Nobel - in the immediate aftermath of the first detection in 2015. But Drever died in March this year and Nobels are generally not awarded posthumously. The Scotsman developed some of the early laser systems at Glasgow University before taking this knowledge to Caltech in California, which manages the Washington State Ligo facility. Glasgow remains the UK hub for the big British contribution to Ligo. Its Institute for Gravitational Research designed and built the suspension system that holds the ultra-still mirrors used in the US and Italian labs. Catherine O'Riordan, interim co-chief executive of the American Institute of Physics (AIP), said: "Weiss, Barish and Thorne led us to the first detection of gravitational waves and laid the foundation for the new and exciting era we officially entered on September 14, 2015 - the era of gravity wave astronomy." This is actually the second Nobel prize to involve gravitational waves. In 1993, Americans Russell Alan Hulse and Joseph Hooton Taylor were awarded the physics prize for work that provided indirect evidence for the warping of space. 2014 - Isamu Akasaki, Hiroshi Amano and Shuji Nakamura won the physics Nobel for developing the first blue light-emitting diodes (LEDs). 2013 - Francois Englert and Peter Higgs shared the spoils for formulating the theory of the Higgs boson particle. 2011 - The discovery that the expansion of the Universe was accelerating earned Saul Perlmutter, Brian P Schmidt and Adam Riess the physics prize. 2010 - Andre Geim and Konstantin Novoselov were awarded the prize for their discovery of the "wonder material" graphene. Follow Paul and Jonathan on Twitter.